Nel corso degli anni Speexx è stata insignita di numerosi premi di settore e riconoscimenti che confermano la qualità dei servizi offerti, la crescita dell’azienda e il peso crescente acquisito tra gli specialisti dell’insegnamento professionale delle lingue. Speexx has been awarded for the 7th consecutive time with the prestigious Worlddidac Award. This year’s award is the first L&D industry recognition of the new Speexx Smart Learning solutions and unique approach to microlearning and performance support. Since 1984, the Worlddidac Foundation awards quality and excellence in the educational industry. The award is an internationally recognised distinction and the winner is chosen by a jury of renowned education experts. Training magazine Top 125 is a worldwide ranking of organizations that excel at training and human capital development. Award winners are the organizations with the most successful learning and development programs in the world. The Award has been the most premier learning industry awards program for more than 10 years. 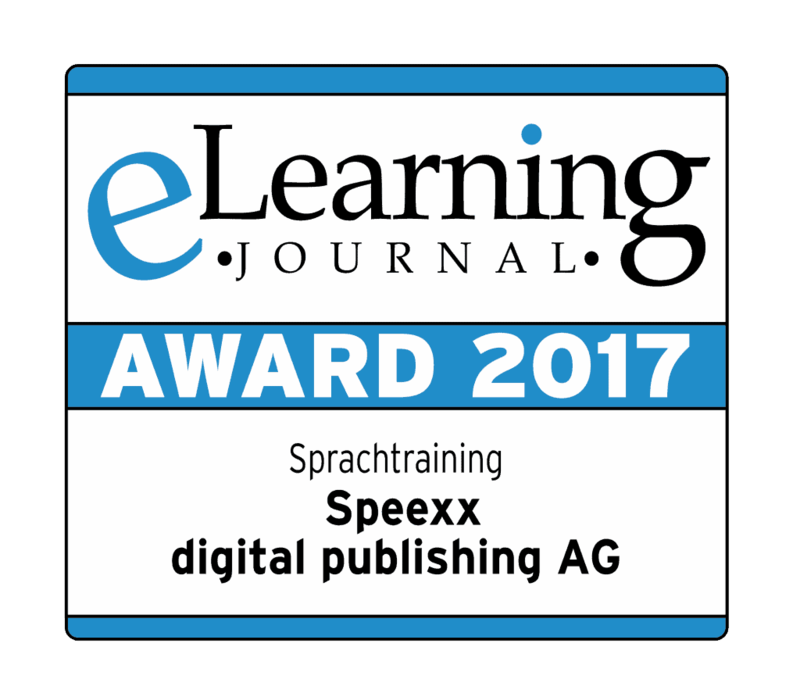 Together with our partner “The Adecco Group”, Speexx 2017 received the eLearning Award in the “Language Training” category. The experts from the eLearning Journal honored the joint “blended learning” project of the company, particularly characterized by scalability and international implementation. The prize was awarded in February as part of the didacta event, in Stuttgart. Speexx has been awarded for the 6th consecutive time with the prestigious Worlddidac Award for the category Blended Learning. Since 1984, the Worlddidac Foundation awards quality and excellence in the educational industry. The award is an internationally recognised distinction and the winner is chosen by a jury of renowned education experts. Speexx was announced as Runner-Up in the Blended Learning category of the 2016 International E-Learning Awards IELA. The award-ceremony organized by the International E-Learning Association for outstanding e-learning products took place at the annual ICEWL conference in New York. The Spanish Association of E-Learning Providers (APel) rewards high quality e-learning solutions with its Excellence in E-Learning Award on an annual basis. In 2015, Speexx secured the award in the category “Most Innovative Learning Solution”. Each year, China’s Training Magazine organizes two major awards: ‘Brand of the Year’ and ‘Outstanding Brand Courses’. In 2015, over 300 organizations submitted projects, out of which 83 were shortlisted for the ‘Brand of the Year’ award. Speexx made it to the final round and secured the Brand of the Year Award in the ‘Corporate Training’ category. The LT-Innovate Summit is the annual point of convergence for the Language Technology Industry to network, discuss strategies and explore innovation opportunities. The Jury rated presentations based on innovation & technology excellence as well as business potential & investment readiness and selected Speexx as the 2015 winner. The IELA Awards Committee look for outstanding e-learning products in terms of educational soundness and effectiveness, usability, and overall significance. 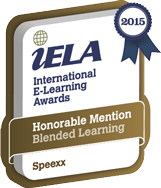 In 2015, Speexx received an Honorable Mention for the Blended Learning category. The Golden Globe Tigers Award recognizes organizations and individuals for outstanding achievements and initiatives which have made a difference in communities around the globe. In 2015, Speexx was selected as the winner in the “Best Use of Technology for Training” category. The Global E-Learning Awards are organized by World Education Congress in Mumbai and showcase the most successful and innovative applications to the delivery of education and training. In 2014, Speexx won the Global E-Learning Award in the ‘Excellence in Blended Technology’ category for its online language training solution. Each year, the IELA Awards Committee look for outstanding e-learning products in terms of educational soundness and effectiveness, usability, and overall significance. In 2014, Speexx was selected as the winner of the Blended Learning category for the second time. Speexx has been awarded with the prestigious Worlddidac Award five times in a row. The Worlddidac Association’s international expert jury described the Speexx learning solution as particularly “innovative and valuable for education”. Speexx is a proud winner of the 2013 European Seal of e-Excellence. The jury selected Speexx for a Platinum Seal among more than 100 applications from all over the world. The Seal is awared to companies who have translated an innovative idea into a successful solution that finds resonance in the market. For the fourth time in a row, Speexx was awarded with the prestigious Worlddidac Award. The Worlddidac Association’s international expert jury described the Speexx learning solution as particularly “innovative and valuable for education”. Speexx has been awarded with the prestigious 2012 Golden Engine Award for ’Strategically and Sustainably Driving China’s Education Industry’. Speexx took the top spot in the ‘Best contribution to the improvement of the education industry’ category and was the only non-Chinese company to be presented with this award. Speexx has been awarded a winner at German IT Innovation Award “Innovationspreis IT 2012”. Among 2.500 competitors, Speexx is a winner in the category “e-Learning”. The innovation award is provided by the “Initiative Mittelstand” among SMEs. Each year products and solutions are awarded, which are outstanding in terms of degree of innovation and customer benefit. The ceremony took place at CeBIT in Hanover. Speexx has been awarded a Gold European Seal of e-Excellence 2012. For the third year in a row, Speexx was honoured with Europe’s prime award promoting the marketing of e-innovation: The widely known Seal of e-Excellence is conferred on companies with innovative products and outstanding marketing on an international scale. Speexx was announced a winner at CeBIT in Hanover, the world’s largest computer expo. Speexx has received full certification in SCORM 2004 3rd edition by the eLearning industry’s certifying body, Advanced Distributed Learning Institute (ADL). The Speexx language learning solutions will ensure the hassle-free interoperability and reusability of its learning systems and content. Speexx has received the prestigious BOOAOO e-learning Award in China for excellence in education for its innovative language learning courses called Speexx out of more than 40 competing training solutions. Following an extensive evaluation process conducted by an international board of education experts, Speexx has been awarded with the renowned Worlddidac Quality Charter (WQC). To be certified, a company has to meet the highest demands regarding product quality, after-sales support and corporate governance. “A certified company also stands for educational excellence, innovation and long-term stability,” states Kateryna Schütz, Project Manager at the Switzerland-based Worlddidac Association. Speexx has been re-certified with the coveted seal, which is awarded for a three-year period. Speexx has been allocated a Gold winner at the European Seal of e-Excellence awards in Hanover, Germany. The winners were announced at CeBIT in Hanover, the world’s largest computer expo. For the second year in a row, Speexx was honoured with Europe’s prime award promoting the marketing of e-innovation: Awarded annually by the Forum of e-Excellence and its partner associations, the widely known seal is conferred on companies with innovative products and outstanding marketing. Speexx convinced the top-class jury with its consideration of the requirements of a global workforce and its flexibility. Speexx received the renowned prize at the Casino de Paris in front of 1,500 specialists of the French vocational training industry. The “Nuit de la Formation Professionelle 2010 ” honors innovative projects for advanced vocational trainings. For the eighth consecutive year, the European Multimedia Forum (EMF) and its national and regional partner associations awarded ICT and digital media companies with the Seals of e-Excellence 2010. Speexx was honoured with the Platinum Award 2010. This prestigious European Award confirms Speexx’s excellent track record in the innovative marketing of digital products and services. “Both the content of the standard courses provided by language-teaching specialists and the techniques integrated in the courses, such as the innovative speech-recognition feature ‘IntelliSpeech’, are of extremely high quality.” The UK Institute of IT Training hosts the annual awards to recognize outstanding examples of high standards, best practice, innovation and excellence within IT training. The awards are firmly established as the benchmark for excellence throughout the IT training industry. Based on a voting population of more than 8,100 end users and purchasers of business software, the survey for the Software Satisfaction Award was one of the largest individual pieces of business opinion research in the UK and across Europe.  The Software Satisfaction Award was Speexx’s first audience award. Participants in the survey were asked to rate the products’ ease of use, functionality, reliability and value for money. The submission for the award was based on a case study highlighting the use of the Speexx’s blended learning language training at the leading automotive supplier MAHLE in Shanghai, China. In presenting the award, the jury composed of members of the UK eLearning Network ELN emphasized that the award specifically recognized the innovative technology and pedagogical value of Speexx’s language training solutions. The Worlddidac Foundation’s specialist jury distinguished Speexx’s corporate language training Speexx as an outstanding concept, adding that it especially stands out through its considerable potential for the improvement and facilitation of learning and teaching languages. Speexx received its certification under the Worlddidac Quality Charter (WQC) following an extensive evaluation process conducted by an international jury of education experts. This prestigious designation was presented to Speexx by the Worlddidac Foundation, an independent, international trade association for the education market with members in more than 50 countries. The Worlddidac Quality Charter is a quality certification for companies who participate in educational projects worldwide. At the Association de Gestion de Réseau des Centres d’Etudes des Langues des CCI, the Speexx solution is used exclusively at 82 language learning centers of the French Chamber of Commerce in their blended learning approach. The Speexx English learning software solutions and the IntelliSpeech accent reduction tool were awarded with the UNESCO Award – Prix Möbius International.